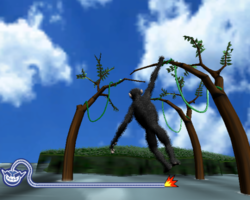 Info "Swing skillfully from branch to branch, you crazy monkey!" Monkey Crossing is one of Orbulon's Microgames in WarioWare: Smooth Moves. With the controllers facing one another, the player has to flick them out toward the TV screen to swing the arm. They must alternate between them to swing across the trees to the island. 1st level difficulty: Two trees. 2nd level difficulty: Three trees. 3rd level difficulty: Four trees. This page was last edited on February 20, 2018, at 18:31.